Selecting an attorney...is an important decision. Because you will be entrusting your concerns and significant matters to an attorney, it is essential to know who your attorney is and with whom he has associated. HAHN, WALZ AND KNEPP traces its beginnings to the law practices of Wilford V. Walz and Charles W. Hahn, which began in 1926 and 1933 respectively. The present association began in 1986 when the firms of Hahn and Knepp, and Walz and Walz moved to 509 West Washington Avenue. Each attorney has developed a practice with a different focus, but with overlapping expertise. This allows you to select one attorney whose practice and experience meet your immediate legal requirements while giving you ready access to a variety of legal services to meet your business and personal needs. 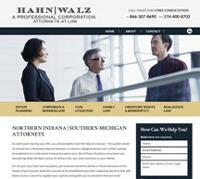 Computer technology has permitted the attorneys at Hahn, Walz, and Knepp to serve their clients' needs in a prompt and efficient manner.